for the bam alignments. At least one of --frags or --jumps must also be given. argument using bwa or bowtie2. This argument may be specifed more than once. --genome argument using bwa or bowtie2. This argument may be specifed more than once. using bwa or bowtie2. This argument may be specifed more than once. of the above bam types. Use this directory for all output files. If specified, a file listing changes in the <output>.fasta will be generated. than the default QP (quality-weighted percentage of evidence) field. a genome browser to be written. equivalent to "--vcf --fix all,breaks". exceed this size (default 10000000). "none": none of the above; new fasta file will not be written. "novel": assemble novel sequence from unaligned non-jump reads. Dump reads for local re-assemblies. Use reads marked as duplicates in the input BAMs (ignored by default). Output IUPAC ambiguous base codes in the output FASTA file when appropriate. Use reads which failed sequencer quality filtering (ignored by default). is a fasta element name optionally followed by a base range. scaffold00001 and coordinates 10000-20000 of scaffold00002. Degree of parallelism to use for certain processing (default 1). Experimental. Assumes bases are of this quality if quals are no present in input BAMs (default 15). end of the good reads will be ignored (default 10). 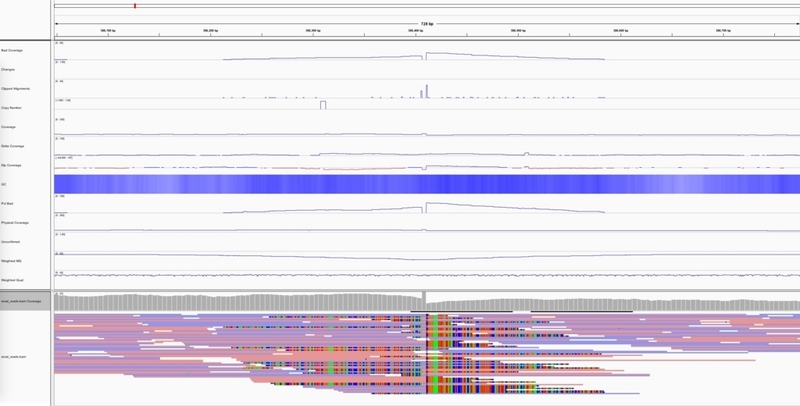 Kmer size used by internal assembler (default 47). is 10% of mean coverage or 5, whichever is greater). --genome genome.fasta　The input genome we are trying to improve, which must be the reference used for the bam alignments. At least one of --frags or --jumps must also be given. --frags frags.bam　A bam file consisting of fragment paired-end alignments, aligned to the --genome argument using bwa or bowtie2. This argument may be specifed more than once. --jumps　A bam file consisting of jump (mate pair) paired-end alignments, aligned to the --genome argument using bwa or bowtie2. This argument may be specifed more than once. --unpaired　A bam file consisting of unpaired alignments, aligned to the --genome argument using bwa or bowtie2. This argument may be specifed more than once. --bam A bam file of unknown type; Pilon will scan it and attempt to classify it as one of the above bam types. --outdir　Use this directory for all output files. --changes　If specified, a file listing changes in the <output>.fasta will be generated. --vcfqe　If specified, the VCF will contain a QE (quality-weighted evidence) field rather than the default QP (quality-weighted percentage of evidence) field. --tracks　This options will cause many track files (*.bed, *.wig) suitable for viewing in a genome browser to be written. PLoS One. 2014 Nov 19;9(11):e112963.